While Xingyi Danielle was visiting China they ran into people selling dogs on the street. Xingyi from Singapore was not accustomed to this tradition and found it barbaric that people were cooking dogs on the streets. He saw a man carrying a dog in a bag, when he questioned the man he said he was going to cook the dog. Xingyi asked how much for the dog and offered $50 for him, the man agreed and gave him the dog. 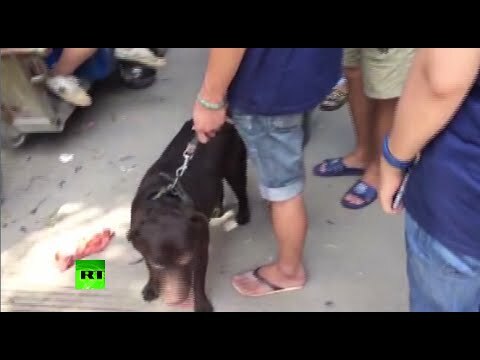 Xingyi said that the dog was going to be cooked within a matter of minutes as the man was walking to the street vendor. Yulin Dog Meat Festival runs each year in late June and more than 10,000 dogs are brutally killed and eaten by the locals.